Did you know that RetailMeNot, world’s largest marketplace for digital offers, has a coupons app that makes it easier to save in store with thousands of coupons at the places you love to shop ? Did you know that by downloading this free app, you could also have a chance to win $10,000 cash or instantly win up to $250 in eGift cards from your favorite retailers ? Now through December 31, 2014, download the RetailMeNot Coupons app from the App Store (Apple devices) or the Google Play Store (Android devices) and register for the sweepstakes within the app for a chance to win up to $10,000. Then, play the Instant Win Game for an instant chance at an eGift Card. No Apple/Android devices ? Don’t worry, you can also participate online. A maximum of seven sweepstakes grand prize winners will each be given a check in the amount of $10,000 ! Plus, a total of 5,930 instant win prizes will be awarded throughout the promotion period each consisting of up to $250 in eGift cards from Amazon, Best Buy, Sears, Domino’s, Starbucks or Walmart. Participation into the RetailMeNot Score the Savings Holiday Sweepstakes is offered and open only to legal residents of the fifty (50) United States (including District of Columbia) who are at least eighteen (18) years old at the time of entry. All entries/play must be completed before 11:59 p.m. ET on December 31, 2014. You may enter/play by either method of entry. Online: Visit http://rmn.promo.eprize.com/holiday/?affiliate_id=OAMOE and begin by entering your email address and selecting the retailer you prefer if you are a winner. This step will earn you one entry into the sweepstakes. Then, you will be invited to play instant win game which consists of moving your shopping bag left and right to catch holiday gifts on your shopping list. When you’re done, click DID I WIN? to see if you’ve won instantly. RetailMeNot App: Download the app for free, if you do not already have it, and follow the instructions withing the app to register for the sweepstakes and play the instant win game. 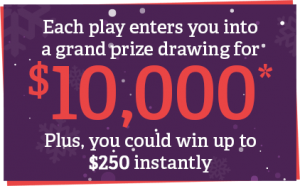 Earn more sweepstakes entries and additional instant win game play by sharing the promotion with your friends! Earn $20 in saving points during the game (+1 additional entry per day). Some entrants don’t use Twitter or won’t take time to answer a survey. This mean you will obtain more entries/play than them which will increase your chances of winning. You will be limited to enter/play one (1) time per day during the Promotion Period, excluding the bonus entries/play as mentioned above.